This blog post has been in the making for several years. I have cooked it, shot the cooking process, but never got around to a final shot because well, my stomach happened. One of the challenges of been a food content creator and recipe developer is that especially for blog posts (not commissioned assignments, the prop is your meal. If you happen to be developing content with the said prop while hungry, let’s just say the end is obvious. This time I managed to restrain myself. And only because I was fasting while blogging. I guess that is the secret. I love these so much and I really love to make them fresh. Several years ago I invested in cute and very useful handheld tostones presser which makes the perfect, uniformed tostones. 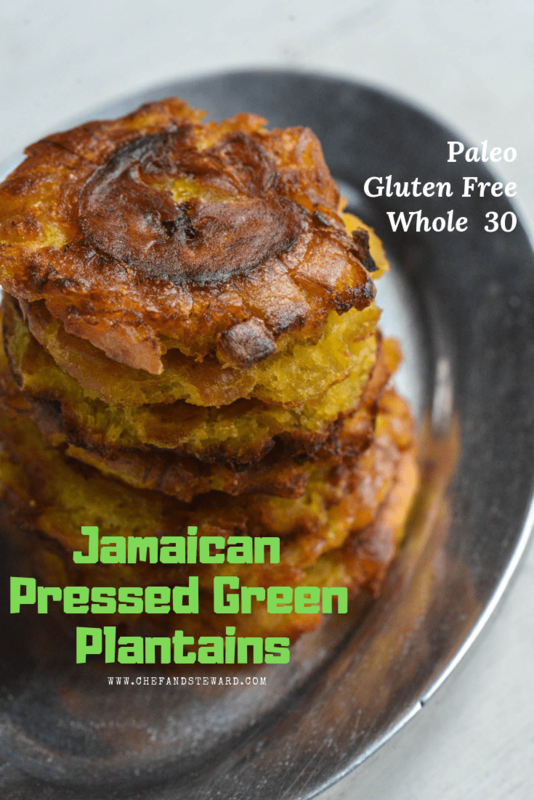 The traditional way to make these in Jamaica is to cut them bigger, fry them and then press them in between the skins of the green plantains. 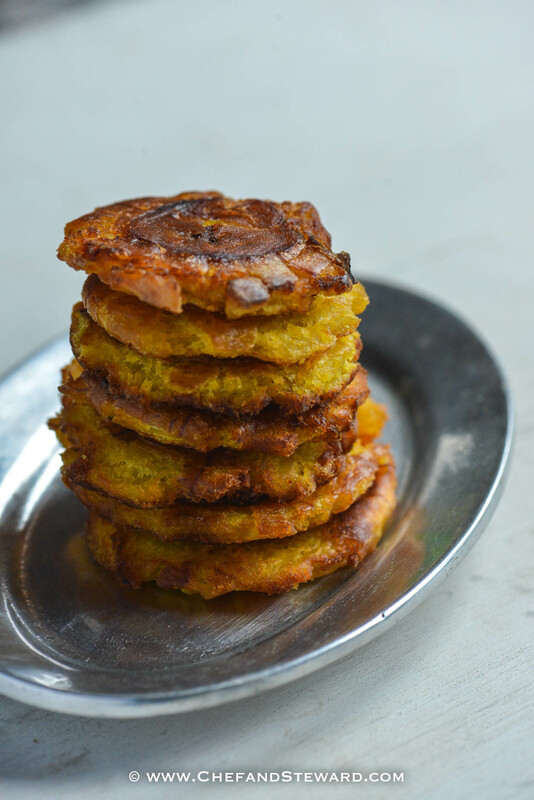 This way is so much better and yields a nice crispy tostones, which is the perfect bed for all sorts of toppings. You can serve them as is with a bit of salt sprinkled on top or as a side for other dishes. We often have them for breakfast in Jamaica but my presentation elevates them to swanky party food, as they are the perfect canapés when entertaining at home. 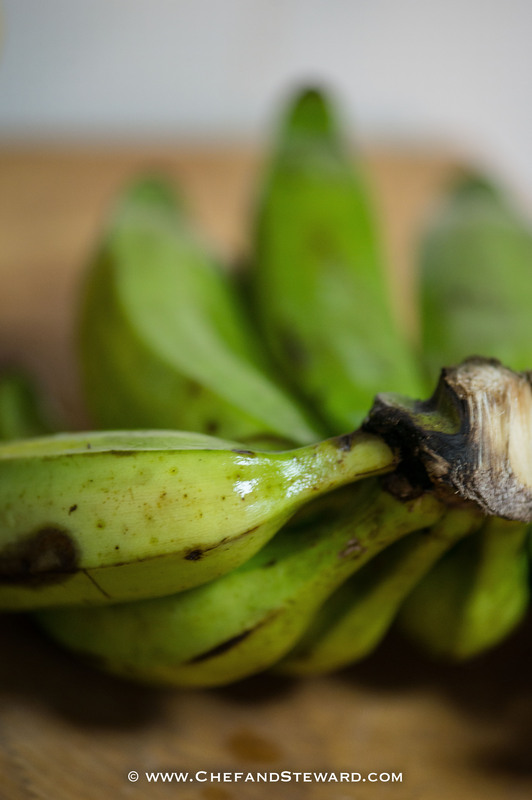 First things first, you want to buy very green plantains, not ripened ones. If some of them have just barely started to turn a slight yellow, that is also OK. I usually use this Jamaican Tomato & Saltfish Salad as a topping for mine. But tomorrow I am going to post a brand new ground-breaking topping coming out of my Chef and Steward Test Kitchen. Heat pan. Add oil to hot pan. 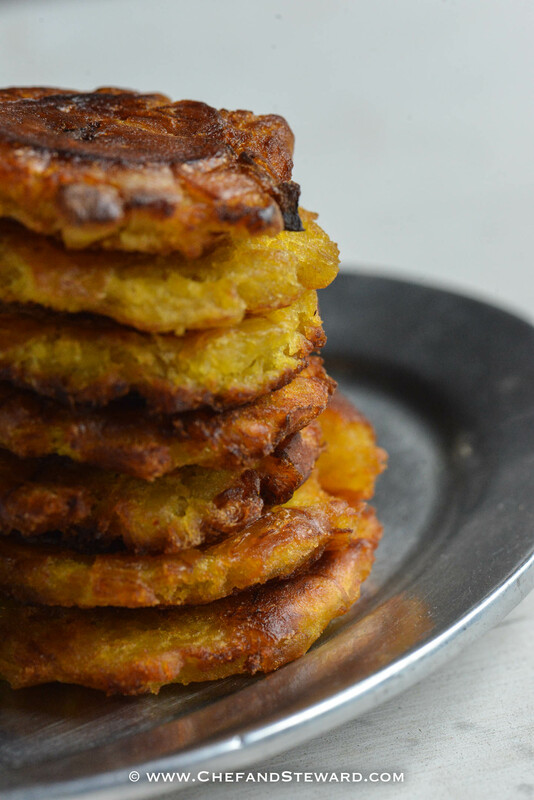 Smash each in the tostones presser or between the skins of the green plantain. If not eating with a salty side, sprinkle with salt. Otherwise, hold the salt! I absolutely love tostones! I actually just watched the movie Chef where they make them and it really made want to have some! Your recipe looks delicious so I will definitely be giving it a try! Have fun! Both my husband and I love that movie! What an easy and delicious side. I love your description of swanky party food and I’m going to give these a try for our next dinner party. Please do and be sure to put the kiddies to work too! These sound so good. I can’t decide if I want to try them for breakfast or a swanky party dish. I guess I’ll just have to try both ways! Thanks so much for sharing. Can’t wait to make these. Yes they are so versatile from the humble to the swanky. Totally moreish. These look so yummy! I love plantains, so there really is about 0% of this recipe I don’t like. I wish I had plantains right now! 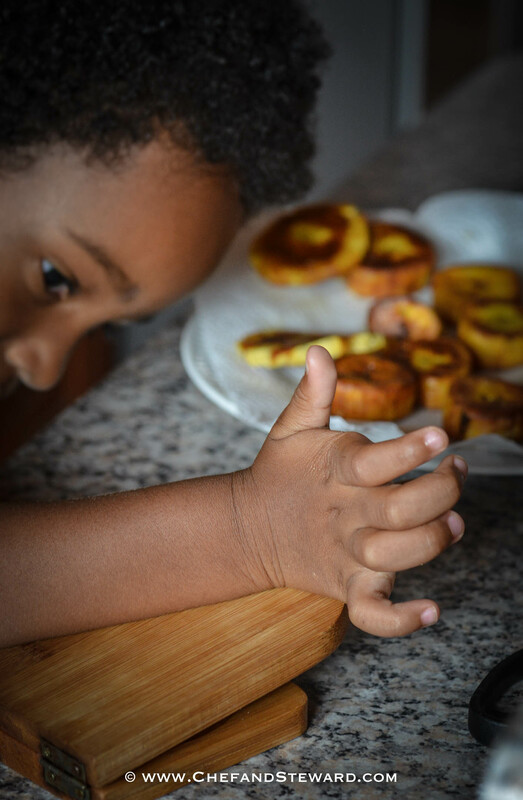 I love plantains every way! Green, ripe or in between… all day, everyday! I’ve never tried these but they look super delicious! 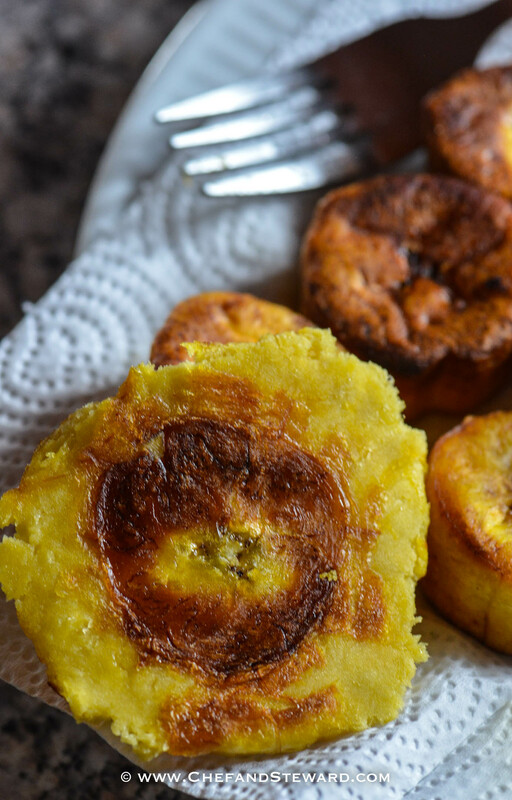 I wish I had some plantains now so I could make this! 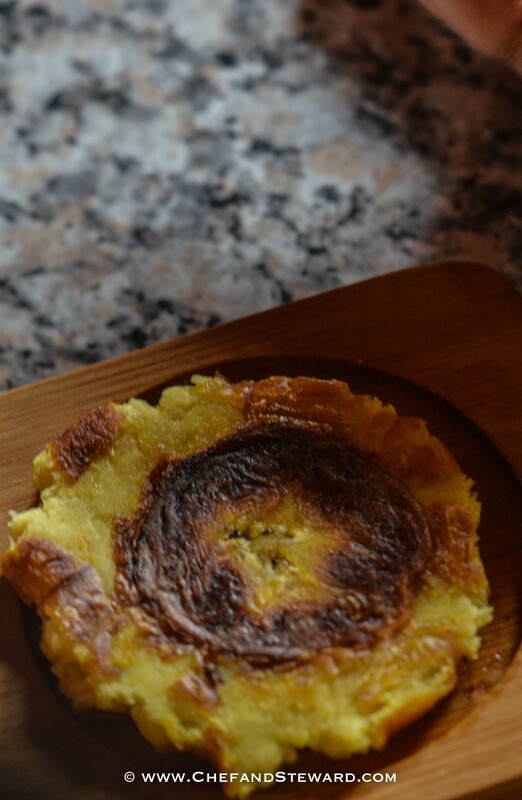 These tostones look so yummy! I would so love to taste them! Sadly we can’t find them here in Italy. Perhaps I need to come and visit you to try them! Oh that is a bummer. Not even in African food markets? If you ever take a trip to Spain, look out for them. You are welcome to Aruba anytime! Wow! These look awesome. I’ve never made anything like this before but, they seem so pretty easy! That’s really my food ethos. Quick, easy, tasty and healthy. Ye Mireille, we share so much rich history. I am dying to taste Haitian food! 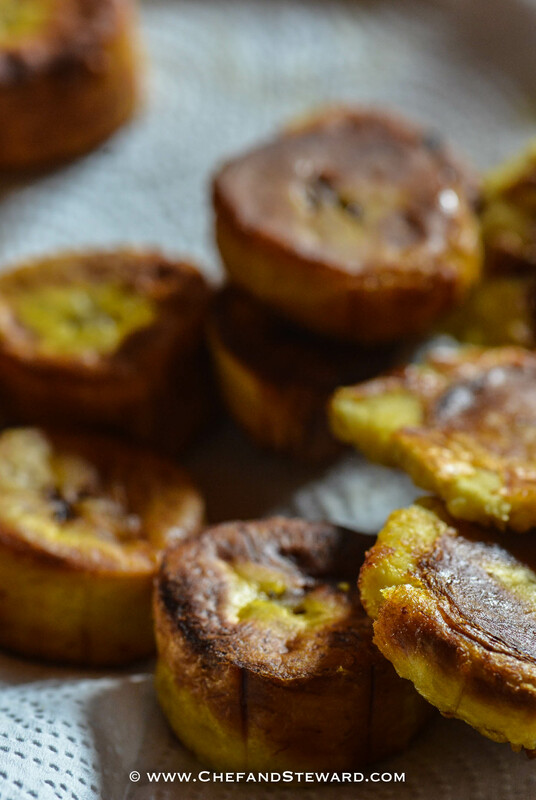 Caribbean cuisine is so delicious, my husband is Cuban and of course I had to learn how to cook plantains and making tostones is fun and the result is amazing. Yours look perfect! I would do anything to spend a week around your dining table! I love tostones! I’ve never tried to make them at home – but now I need to give it a try! Happy to show you how! 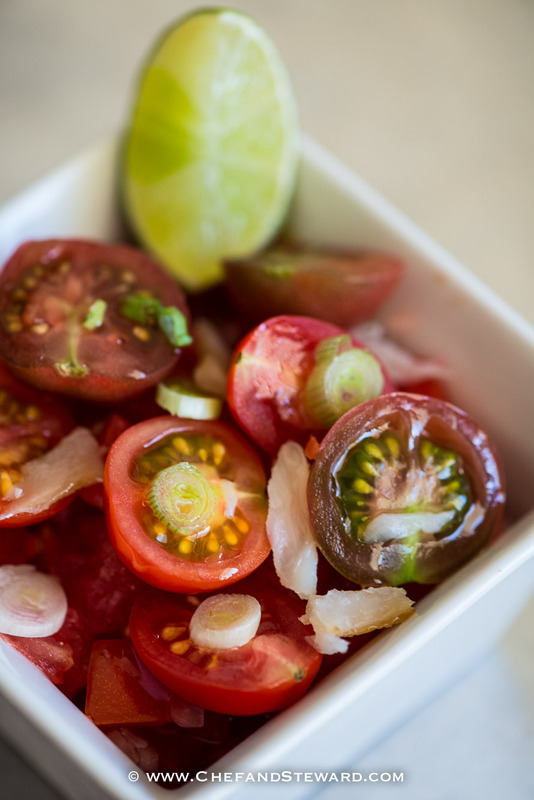 DO you serve the green ones as an appetizer in Haitian cuisine? I am longing to try Haitian food! I like everything Jamaican. I think it is such a special cuisine that has so much to offer! 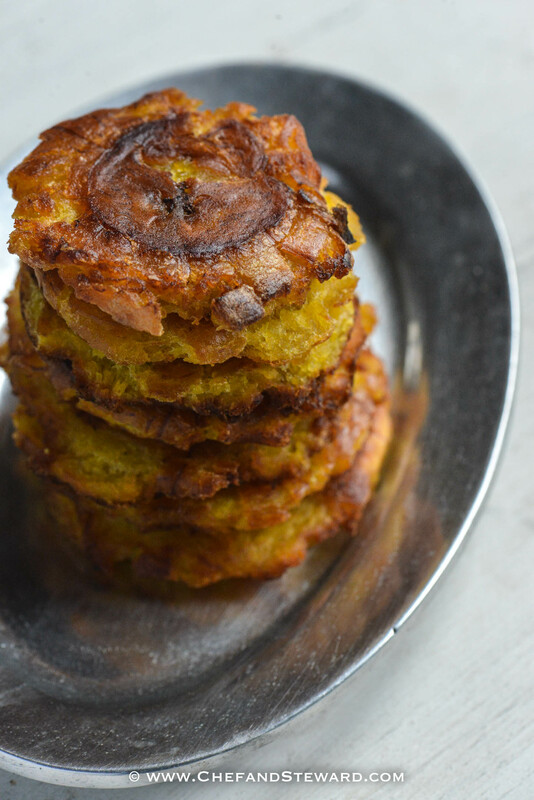 And these tostones are a great example. Wonderful recipe! Awwwww that really warms my heart. It’s great to have such positive reactions to our native dishes from my home country.